If people like you, your food tastes better. Fabio’s interview from three weeks ago was such a success that we just had to go back for more. Is he really tight with William Shatner? Does he put Nutella on sugar cereal? Find out below. Part II is here. FV: This is something the United States has! FV: Come on man! You want to come up with something to leave the show because you can’t take it! Run into a wall and crash your head open. If you’re a chef take it like a chef! DB: Chef, that seems kind of extreme. FV: At the end of season five I dislocated my knuckle, well I broke my pinky finger –it looked like a little sausage actually and they strongly suggest I go to the hospital -but I taped it around a fork and went on to win the challenge after that. So you want to be a chef? Learn how to take it – something always goes wrong in the restaurtant business. DB: All chefs seem to agree on that. FV: Of course! Otherwise you go baby sitting ok!? DB: Back to the contestants that are still on the show. Last week Morgan seemed to be on a roll. FV: In a show like Top Chef people remember people, people don’t remember dishes. Think about past seasons, Harold, Hung, Hosea… they won their competitions but they didn’t win the people. DB: It’s a popularity contest? FV: If people like you, your food tastes better. DB: So as a chef, to get the most out of Top Chef you have to win the hearts and minds of the viewers? FV: They [the contestants] work in the food business but it’s really the people business. You can be like Morgan and win 2o challenges in a row but if people don’t like you, regardless of how good your food is, you won’t be successful. DB: What do you think about the competition on Top Chef: All Stars (coming in Dec)? FV: If I am on my game and confident about what I am cooking there is nobody who can beat me. In the competition it’s going to be about who’s best on that day. In season five Stephan was technically the best chef but Hosia had a better run in the final and won. DB: So it’s pretty wide open depending on what they make you cook? FV: That’s why season eight is going to be so interesting because you have the winners from the past seasons and each one of us specialize in a certain kind of food but during the competition everyone is going to have to cook something outside their expertise. DB: What else do eat for dessert when you come to New York ? FV: I like Gramercy Tavern and Union Square Cafe but as we’ve talked about I get bored with the big sweet finish. DB: Yeah, but what about the soon-to-be famous Nutella and cornflakes? FV: Don’t get me wrong I love sweets but the greatest dessert is the one I crave. Here ‘s and example. I was up in Rochester, NY doing a private dinner. I was barbecuing and the next door neighbor was baking something, I had no idea what it was, but I literally walked out of the house and knocked on the door of the neighbor and there was this was amazing aroma of apricot pie I say “I need to have a slice of that pie or I ‘m not going to live tonight!” So they give me this big slice . So I don’t look forward to dessert but when I crave something it’ the best! DB: Chef, thanks again we’ll be following you on All Stars. See Part I here: Fabio discusses Top Chef: All Stars and a life-threatening pie craving!- coming soon! For Fabio Viviani’s first take: Go here. Go here for an interview with contestant Eric Wolitzky from New York’s Baked bakery. For a recap of episode 7 go here. For a recap of episode 6 go here. For a recap of episode 5 go here. For a recap of episode 4 go here. For a recap of episode 3 go here. For a recap of episode 2 go here. For a recap of episode 1 go here. 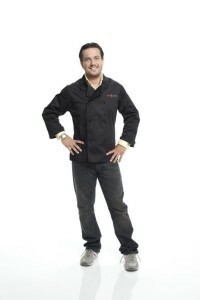 Go here for a look at Johnny Iuzzini. Go here for a closer look at Judge Danielle Kyrillos. Go here for the DessertBuzz Top Chef: Just Desserts preview page.